There are a host of benefits of watching a movie or a TV show having subtitles/closed caption. Subtitles become essential when we are hard of hearing and the dialogue is drowned out by by background noise or sound effects. On the other side, movies with subtitles can help foreign language learners and children improve reading and literacy skills, the list goes on. However, if you buy overseas DVDs, you may not understand the foreign-language subtitles and some old DVDs even don't offer captions. You can easily insert forced/soft subtitles to existing movies on DVDs when converting them. Things are much easier when DVD movie subtitles are available in multiple languages. You can choose the language you want before ripping DVDs. Here we use MacX DVD Ripper Pro, a robust program capable of handling both commercial and homemade/already burned DVDs perfectly, to show you how to do this. 1. Download the DVD subtitles software to your computer, install and launch it. 2. Insert your DVD disc to the computer's drive if you wish to add subtitles to the DVD disc when ripping. Click the Disc button at the top of MacX DVD Ripper Pro's main interface to load the source DVD. As the toolbar displays, you can also add DVD video folder, ISO image and insert subtitles to them. 3. Select an output format. The output profile window appears after the source DVD movie file is loaded. For DVDs that have multiple titles, the tool will automatically pick the right title for you. It provides a wide range of media formats and preset device profiles for iPhone, iPad, Android/Windows phones and tablets (see our detailed guide to learn how to rip movies on DVDs on Mac/Windows if you are new to DVD conversion). Now let's move to the next step. 4. Choose a subtitle in the language you wish to get. Click the subtitles icon to see the available soft subtitle tracks and select the one you want. Most commonly used languages are always included, such as English, French, and Spanish. The Forced Subtitles Only option lets you only get forced subtitles for the movie or TV show. Forced subs are shown when characters speak a foreign language, sign or there's foreign-language content etc. They will play even if you turn off subs. The Disabled Subtitle will remove subs from movies. Optional: You can also tap the Edit button at the right side to initiate the video editing window, where you can cut DVD video to remove unncessary parts, crop the video to get rid of black bars, and even add external subtitles to the movie as you like. 5. Click the RUN button to begin processing DVDs with subtitles in the language you select. If there are no subtitles you'd like to get, you have to burn SRT subtitles to DVDs, DVD Video_TS folders, or ISO Images. It's a bit more difficult since you need to find the subtitles. Use steps below when DVDs come with no subtitles or you want to embed or hardcode other external subtitles to DVDs. 1. Download subtitles for movies on DVDs. It may take some time and patience to dig out the right subtitles for your movies on DVDs. We list some good websites to free download subtitles for any movie and TV show. Note that such free subsites are always brimmed with ads and redirects. Make sure you are downloading subtitles instead of adware. Subtitle download sites you can try: movie subtitles, opensubtitles, tvsubtitles, TVsubs, SUBTITLES HR, THE SUBTITLES. Is it legal to download subs online? Some users are confused. Subtitles are derivative work of the movie or TV show. They can only be uploaded and distributed with the permission of the copyright owners. But we haven't heard of any such lawsuits in the US and Google doesn't shut down free sub download sites. You'd better download DVD movie subtitles for fair use, like personal or educational use. What video subtitles format should you choose? Subtitles have many different formats, like SRT, SUB, SSF, PJS, PSB, RT, SSA. SRT is the most popular sub format, most sites offer SRT subs and you won't go wrong with it. 2. Load the source DVD disc or DVD file. Run the DVD subtitle software, click the Disc icon, or Folder, or Image icon to select the file to process. Choose an output format from the popping up profile window. 3. Click the Subtitle icon and choose Load Subtitle… from the list to show the subtitle window. 4. Add subtitles to DVD, DVD Video_TS folder, or ISO Image. On the sub window, click the "Enable subtitle" box, then select "External Subtitle File" for adding soft subtitles to movies. Click the Add button and choose the SRT sub you download from your computer. The Subtitle Position option allows you to insert the sub on the top, center or bottom of the screen. You will see the result on the preview window. Select the Built-in Subtitle option, you can burn hard subtitles to DVD movies. After you've done, click the Done button to apply the changes to the current DVD video. 5. Click the RUN button to begin adding or hardcoding soft/hard subs to DVD movies. Also see guide to extracting subtitles from DVDs. 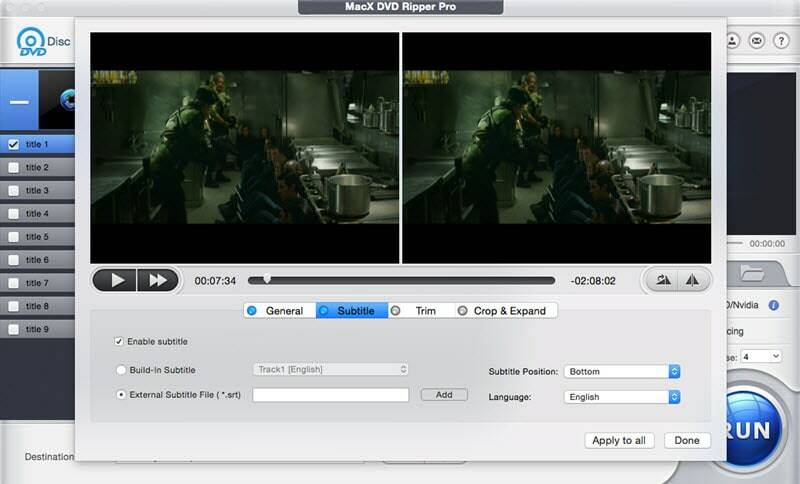 MacX DVD Ripper Pro can easily add/extract external subtitles to/from DVDs when converting movies on DVDs with subs you want. It's an all-in-one DVD processing tool that is able to rip, copy, backup, digitize, and edit DVDs with support for hardware acceleration. What is DVDs? Here's all about DVDs information. How to Copy Protected DVDs that other software can't handle.